A centennial celebration, which like Ellen Moers' excellent Two Dreisers (1969), reaches beyond the vast blunders and dramatic miseries of Dreiser's career (so exhaustively documented by Swanberg in his 1965 biography) to the central tensions in Dreiser's life and work. Through a melding of brief biographical chronologies and an explication of the major novels, Warren probes for Dreiser's overriding obsessions, less to comprehend the man than to explain the significance of the novelist's vision. Dreiser was the perennial outsider, always cosseting the experience of yearning beyond the "'tall walls' of his world." But because of Dreiser's acute consciousness of the glittering lures of a secularized, industrialized America, he was also a novelist of the "metaphysics of society." And always there was the threat of "namelessness," of an absence of identity. Warren follows this malaise through a stimulating investigation of the character Clyde in An American Tragedy, emphasizing the recurrent Aladdin theme -- where dreams of riches given, of what would now be called "instant satisfaction," filled a terrifying vacuum. 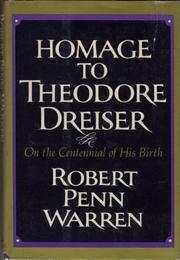 Warren now and then considers Dreiser's "art," but he does not use the word without a wry comment. Nonetheless, his appreciation of Dreiser's dialectic thrust through character is illuminating. A full-dress homage, introduced by three fervent poems by Warren.